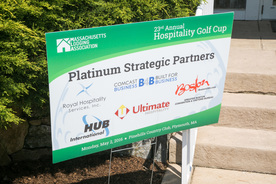 Our product/service partners, whom we call Industry Partners, have direct access to hotels, resorts, motels, inns, and bed and breakfasts across Massachusetts. The MLA provides a variety of venues and tools to help Industry Partner companies promote their products and services to member properties. A comprehensive online "yellow pages" of Industry Partner companies on the MLA website used by hundreds of member properties every month. You will receive a complimentary listing, but can increase your visibility with an upgraded listing or advertisement. The guide, and your blurbs, will be seen by purchasing managers and decision-makers throughout the Commonwealth. Put your products and services in front of a larger audience. Industry Partners can sponsor any number of MLA events and programs and put their names directly in front of property members. We strive to work with our partners and have opportunities for every marketing budget. Industry Partners can meet and talk with general managers, purchasing directors and other key staff at many MLA-sponsored receptions and events held throughout the year, including two special receptions specifically designed for Industry Partners. MLA's monthly newsletter keeps you informed about new MLA members and the latest trends in the lodging industry. Advertising opportunities are available. This excellent resource reaches lodging properties and companies around the state. The MLA logo is available to use on your promotional materials with approval from the MLA. The logo gives your company added credibility with MLA property members, as they want to support those companies that participate with the MLA. Industry Partners can join MLA's Industry Partner committee, which meets to achieve common goals and to work for increased Industry Partner participation. If you are interested in joining this committee, please contact our main office. To view a summary of Industry Partner benefits, click here.